BC Race Cars Inc. delivered our TA2 SCCA Trans-Am race car to its new owner, Rod Darmaga of Ontario, Canada this past week. 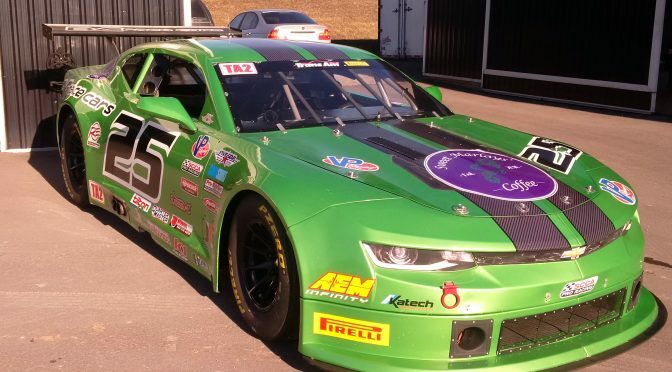 Built in 2014, the #07 Green Machine was affectionately nick-named “Snot” due to its colour, factory green, and became well-known in both Trans-Am circles as well as local regional racing. 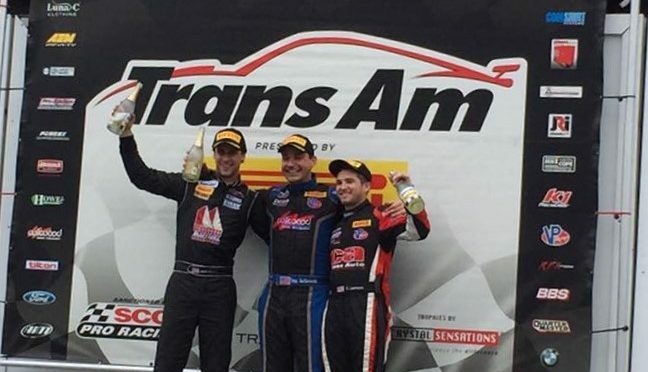 In its four-season professional career, it achieved a remarkable 24 professional starts with only 2 DNFs due to mechanical failure, and usually ran top 10 with a best finish of 3rd at Daytona this year at its final Trans-Am race. In addition, it ran numerous Ontario club races and testing days, winning the local GT-1 championship in 2017. It served at least 20 different drivers thru the years, from first-timers to professionals. All who drove loved the car for its balanced performance, speed and set-up. We are excited to keep this wonderful machine in Ontario and have the opportunity to service and look after it for its new owner Rod. We hope he loves and enjoys Snot as much as we enjoyed building, developing and racing it. BCR First TA2 Podium at Daytona! Josh Bilicki in our #25 TA2 Camaro gave BCR our first podium in TA2 Trans-Am competition at Daytona International Raceway at the final round of the 2017 racing season. Josh was quick out of the box, asking for no changes till he learnt the car and track. With a minor rear spring change, he topped the charts in the 1st official practise and placed 6th in the second on a full fuel load run. In qualifying, he pulled off a beautiful lap, placing second in a tight field where the top 6 were separated by only 0.6 secs, missing the pole by 0.171 of a second! Race day looked scary as the track was wet and the oval does not require a wet set-up. After lots of head scratching, we backed off the dry set-up just a little. It was a super exciting race, watching the different cars and set-ups do well and struggle later as the track dried. Josh was never out of the top 4 and finished with a well-deserved 3rd place after an epic battle in the top 5! BCR looked after 2 other cars, both in the TA class. It was almost a Cinderalla story as Steve Kent Jr., piloting our BCR #15 TA Corvette was also incredibly quick all weekend and almost pulled off a double podium for the team. As a top-notch TA2 driver, Steve was quick in the TA car as well, coming to grips with the additional power and placed 3rd and 6th in the official practises. Qualifying did not go our way, as he was compromised severely by some TA2 cars on his hot laps, ending up 8th. The race was even more daunting for the TA drivers, trying to negotiate the wet conditions with the wide tires and crazy horsepower of these cars. Steve did an amazing job, keeping out of trouble and getting faster and faster as the conditions improved. He made is his way to 2nd where he would run the second half of the race, some 43 seconds ahead of the third place car. With 2 laps to go, a cut water pump belt took him out of the race and robbed him of a well-deserved podium finish! Jed Copham in the #5 BCR C7 Corvette had a horrible accident during Thursday’s practise where he touched with another car on the front straight at over 190 mph, spun sideways and flew up in the air coming down on its roof and crashing into the soft barriers. Jed was OK, in fact walked away with just a minor bruise on his arm, a testament to how well the TA cars are built. A scary moment for all that witnessed it!